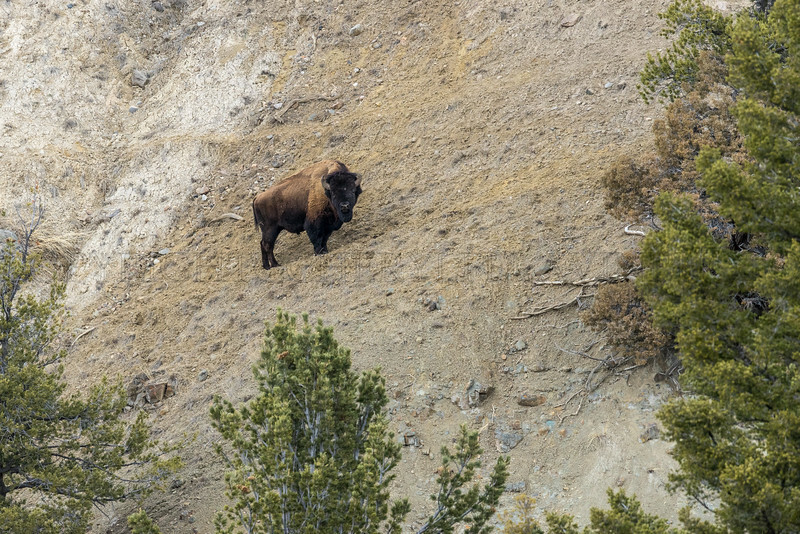 The bison move quite close to the vehicles in Yellowstone, despite that, much respect has to be accorded to them. 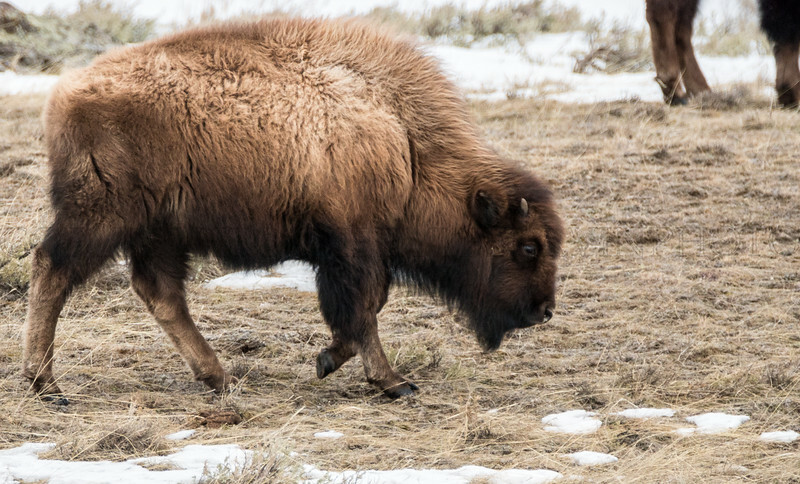 The American Bison or buffalo has made a come back but they are limited to certain areas of the national parks, when their herds grow too large human tolerance for them is very limited. Cattle ranchers raise their herds close to the park. 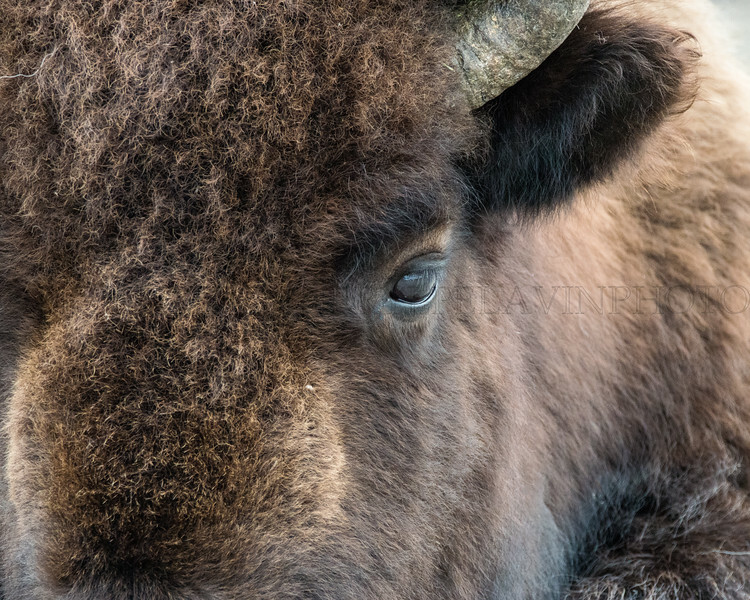 When the bison population swells these ranchers have problems and consequently so do the bison. 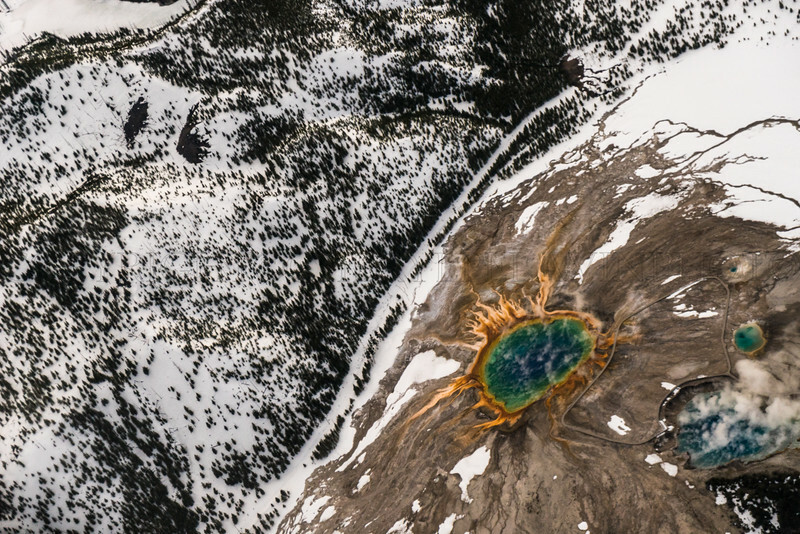 Yellowstone's hills are cut and painted by the centuries of volcanic activity going on underneath the rock. 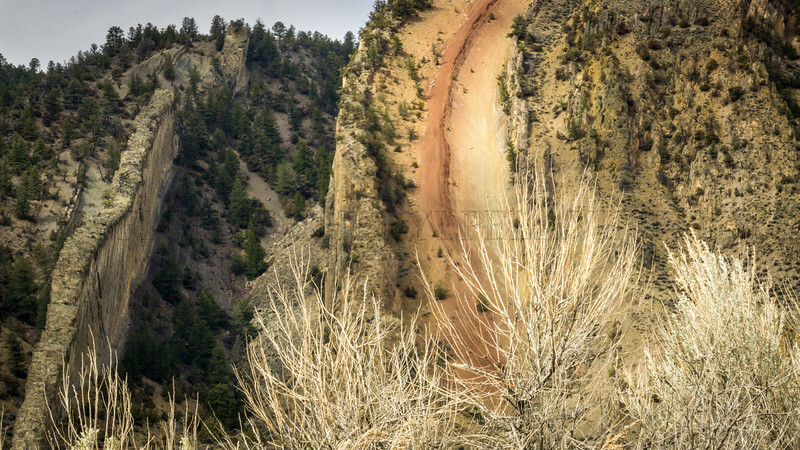 The red is an iron deposit left by the boiling waters pushed up through the rock. 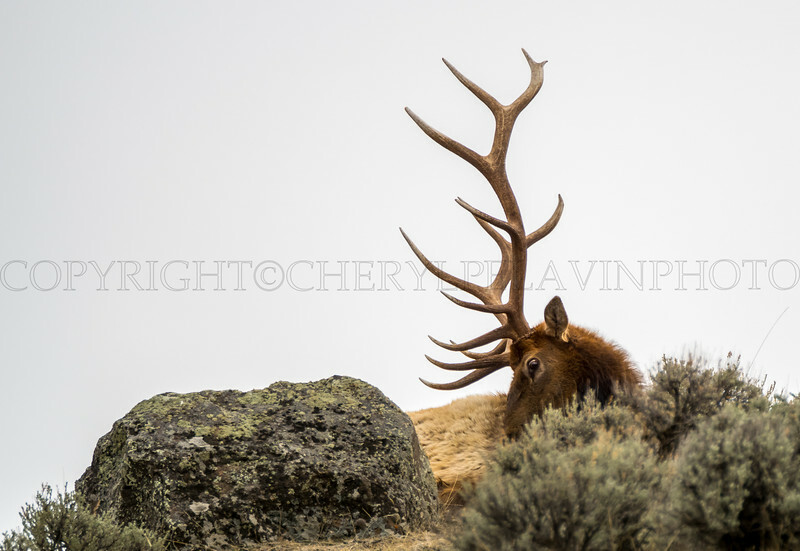 This elk remained on the ground and casually scratched his back with his magnificent antlers. 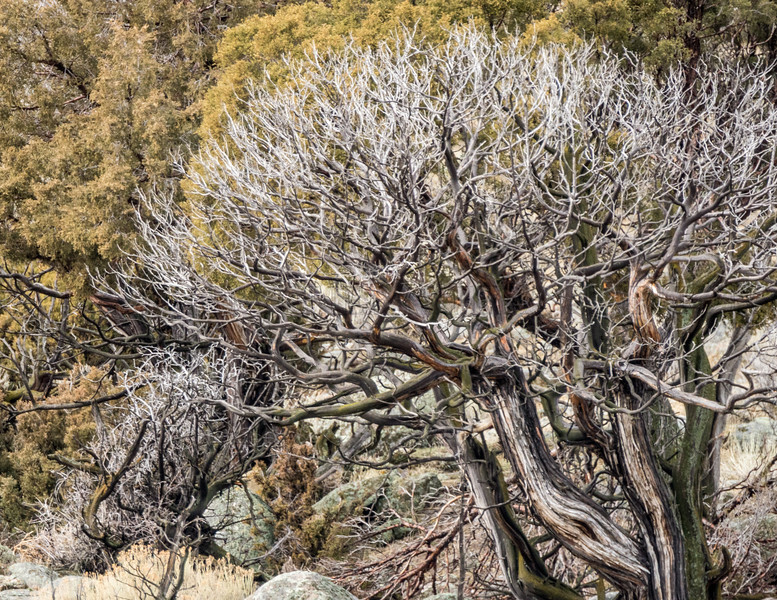 First there was one howl out in the trees somewhere, soon there was a chorus of many singers. This coyote answered and howled with the best of them. 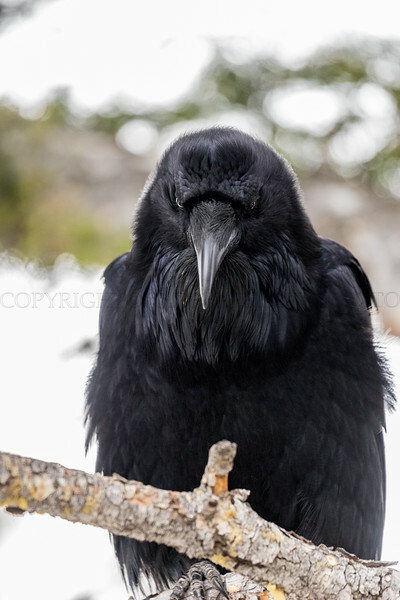 In the Lamar valley the ravens get pretty up close and personal. This fellow/gal (?) was right above me on the tree and was very busy announcing his presence. 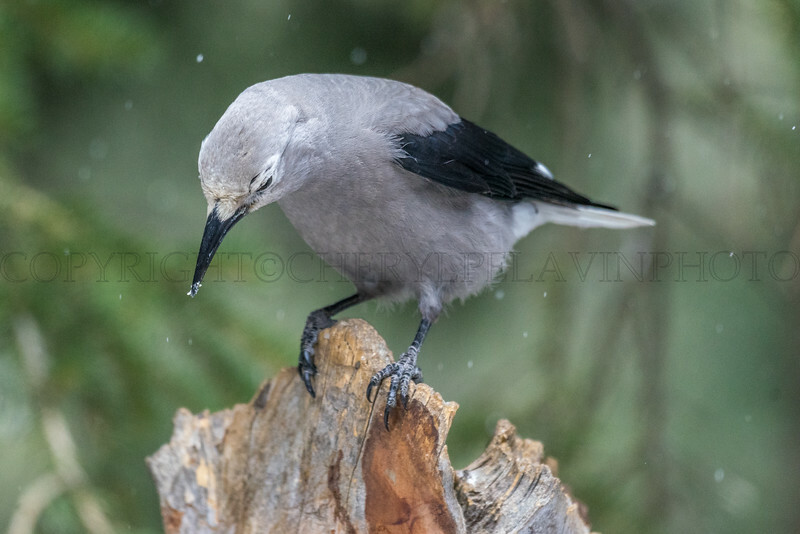 Smashing and cocky, this aggressive jay is common to North Westerners. 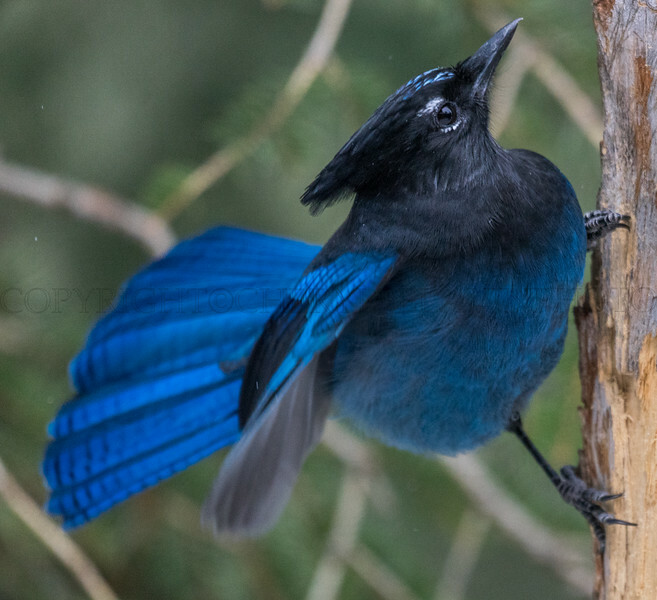 He is a brilliant sapphire blue with gleeming black head and long crest. 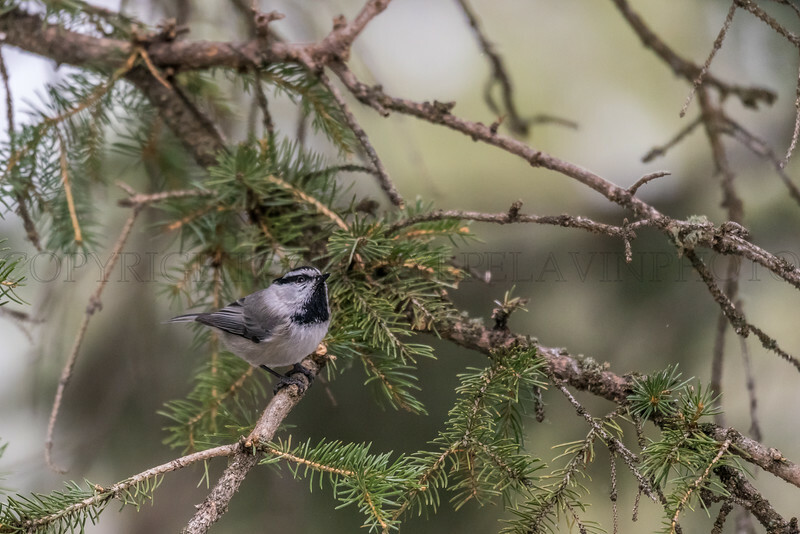 Sweet little puff of a bird photographed at Dan Hartman's bird feeding station. Perched on top of a tree stump filled with bird feed, at Dan Hartman's bird feeder in Cooke City. 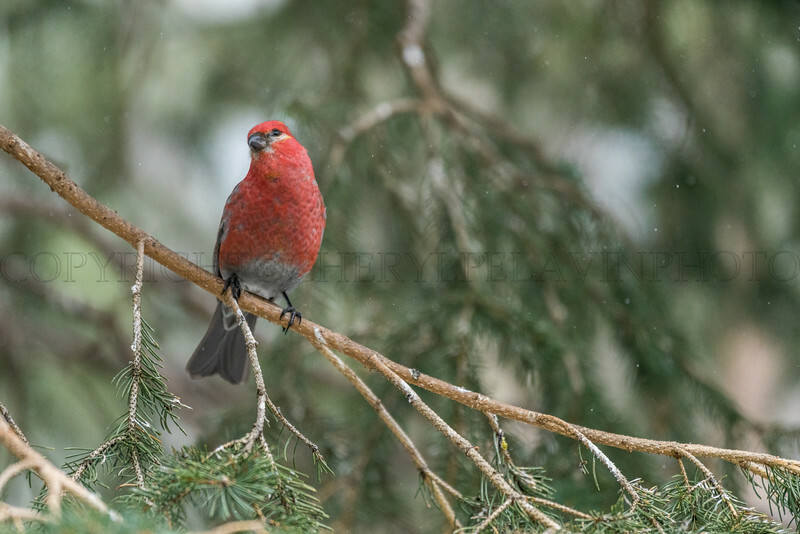 Beautiful rosey finch at the feeding station set up by Dan Hartman in Cooke City. 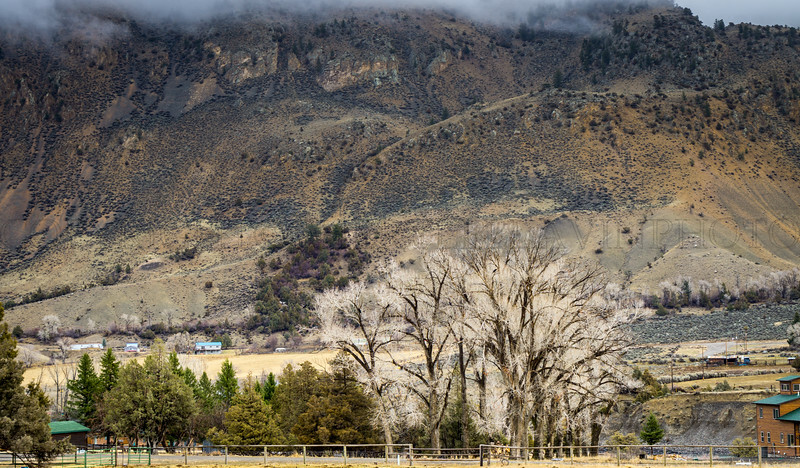 A snowy morning in the Lamar Valley. 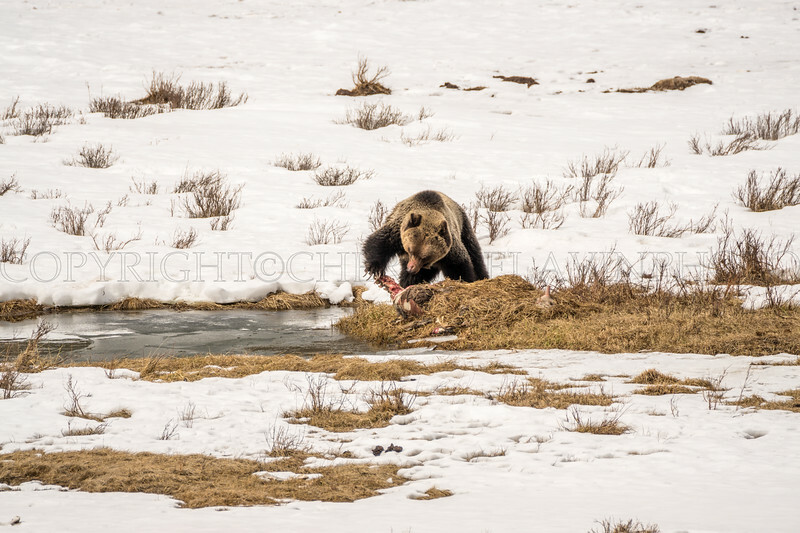 This bear has retrieved the carcass of an elk from the little pond to his right. After eating he covered it in grass and sat on it to protect it from other carnivores. 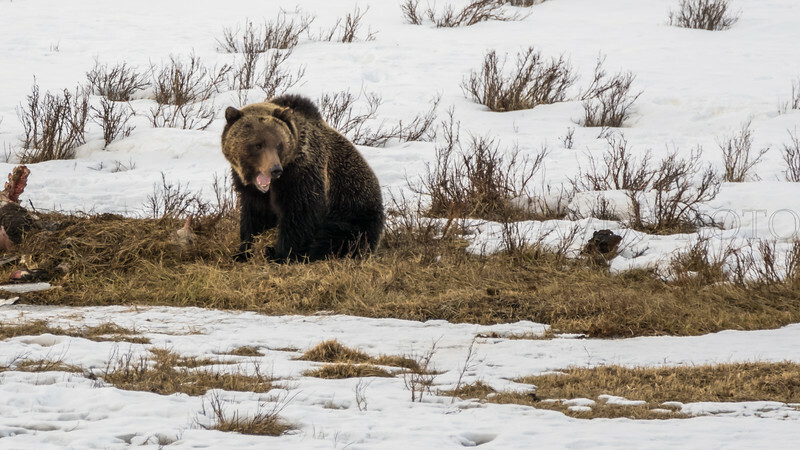 After carefully burying his elk carcass and depositing his body on top of it, the grizzly sat down and panted.. 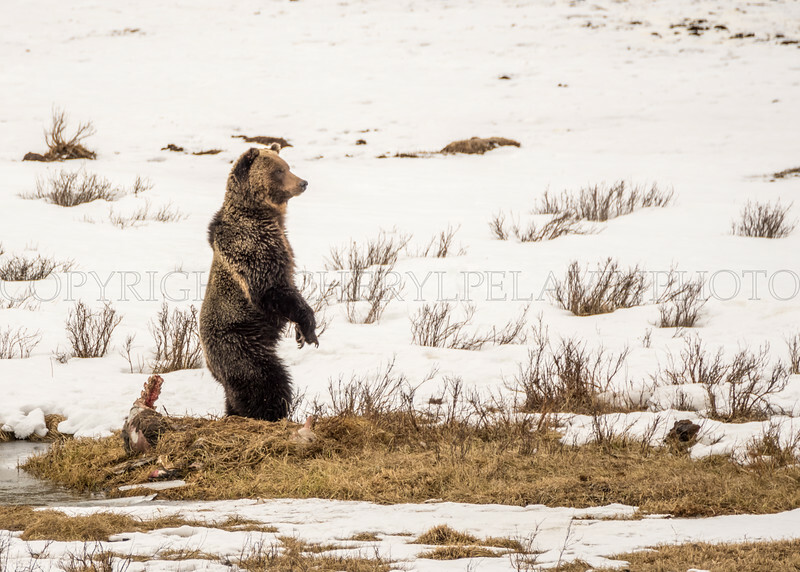 The first grizzly of spring faces a large group of American Bison, he rears up on his hind legs and gets a better reckoning of the size of the herd. 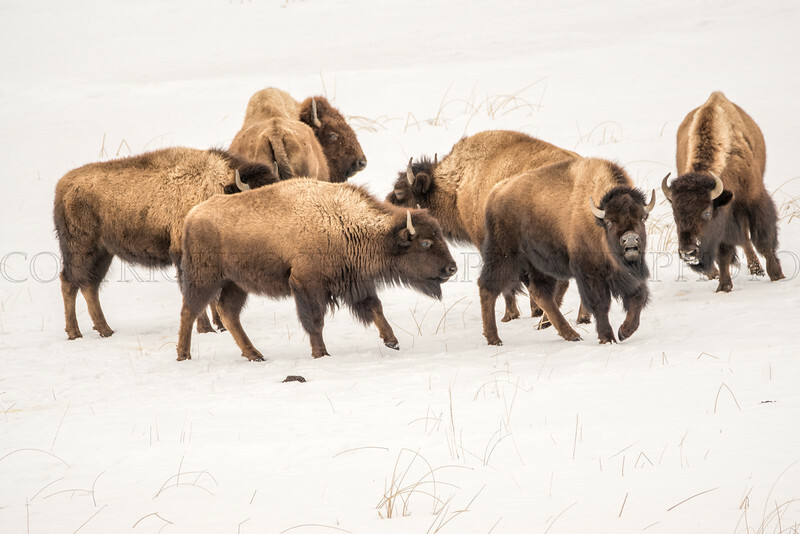 After a standoff of about 10 minutes the bison slowly started to go back in the direction they came from. 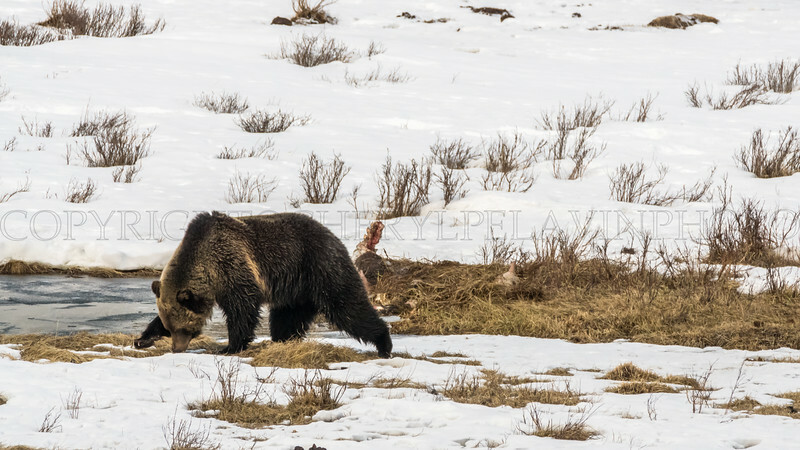 They would not cross in front of or behind the grizzly and his meal. 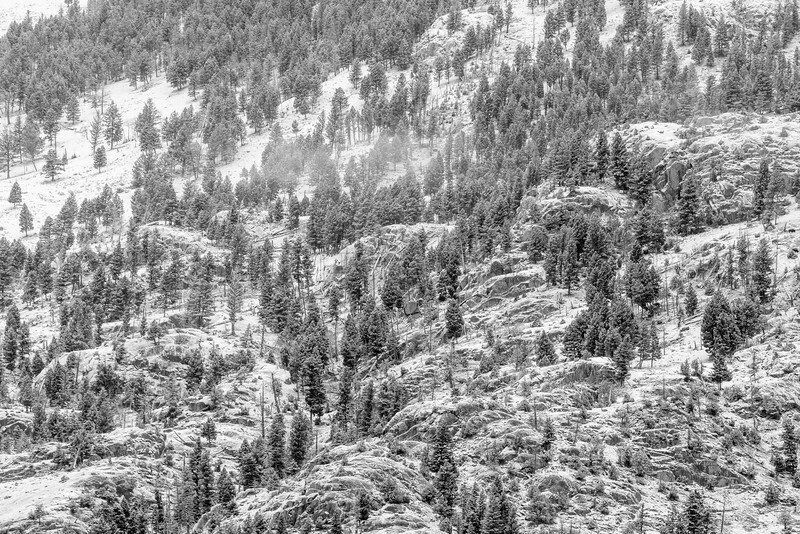 The Grizzly, surrounded on 3 sides, decided to take a walk. 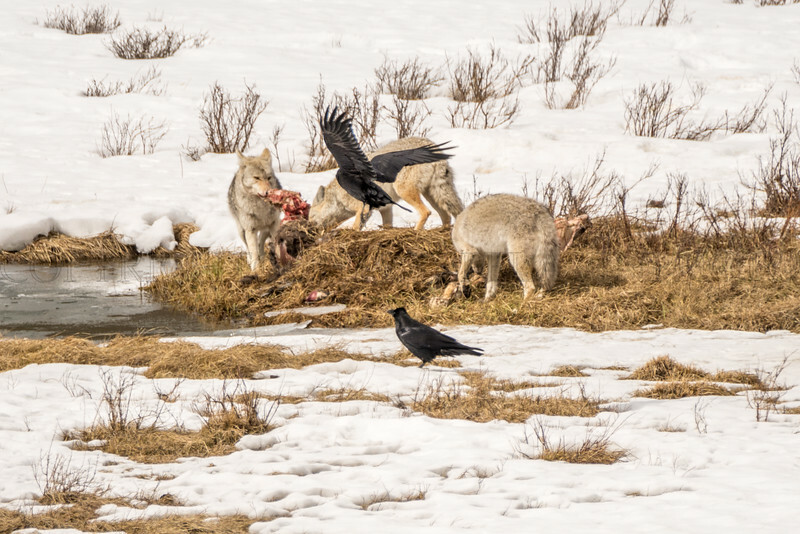 Instantly coyotes and ravens, quarreling among themselves, made use of the opportunity for a meal. It's the next day. 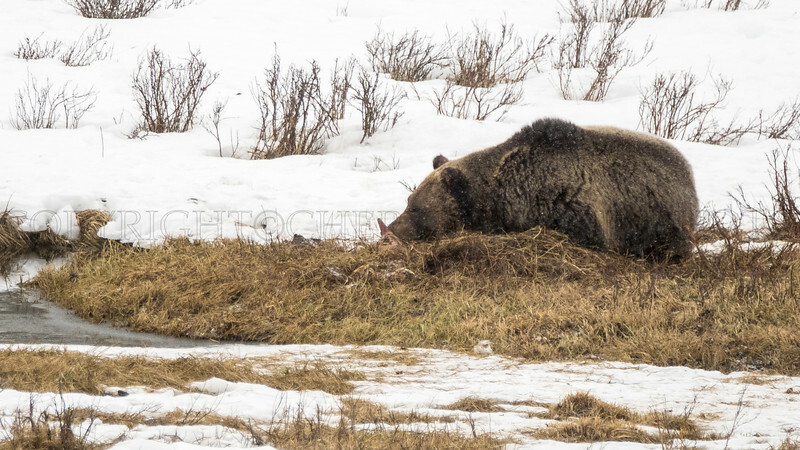 There is obviously less of the carcass present, but our bear, steadfast in the face of snow and intruders, maintains his position on top his elk carcass. A baby buffalo searching for a morsal to eat, winter does not offer much succulent fare. The calf's little horns are just perfect. 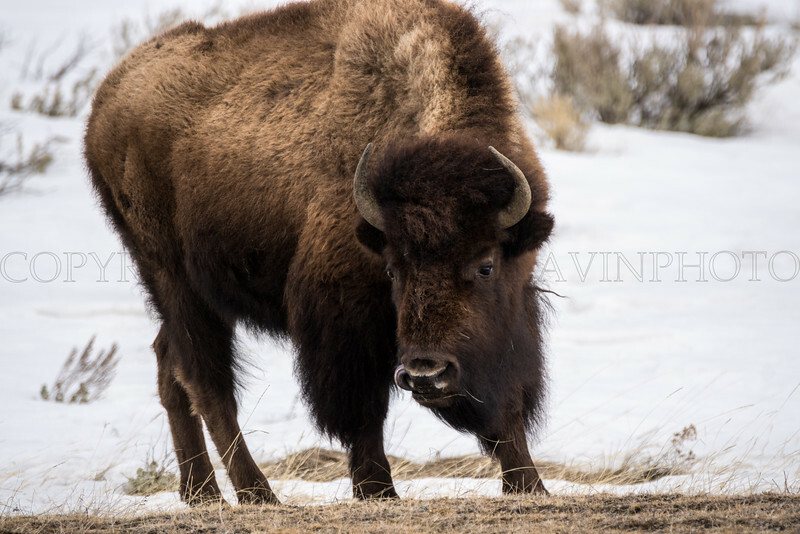 The rich brown of the bison coat is very beautiful, one understands the respect accorded this animal by the native Americans. 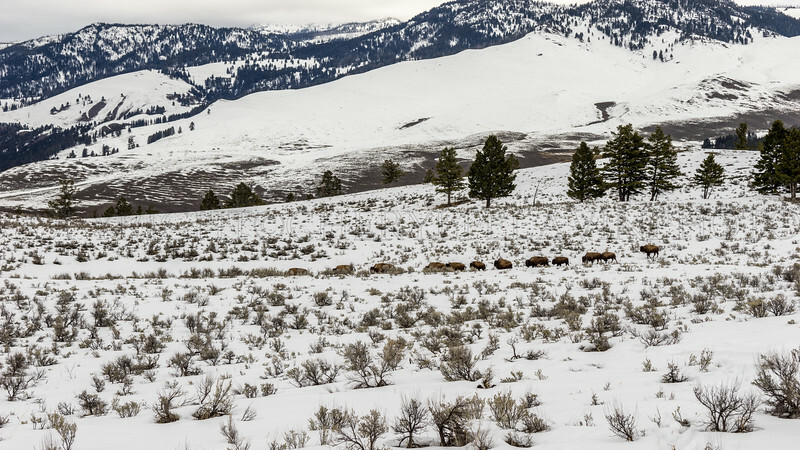 American Bison travesing the broad grasslands of the Lamar Valley. 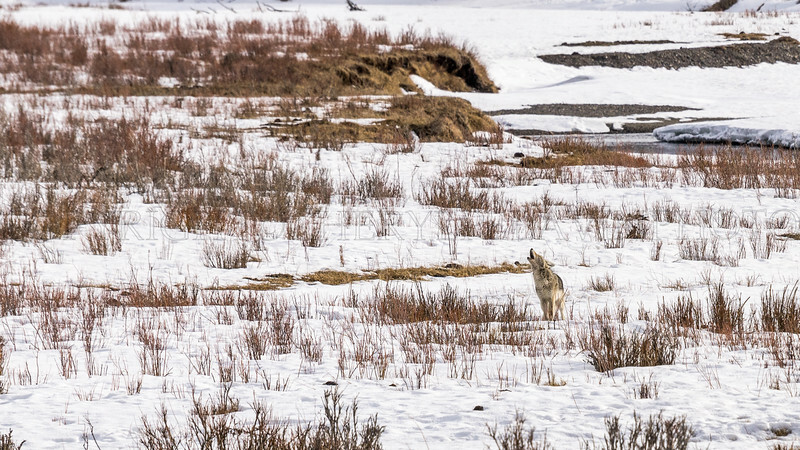 This area with it's streams and wildlife is a big draw for the wolves of Yellowstone in search of prey. 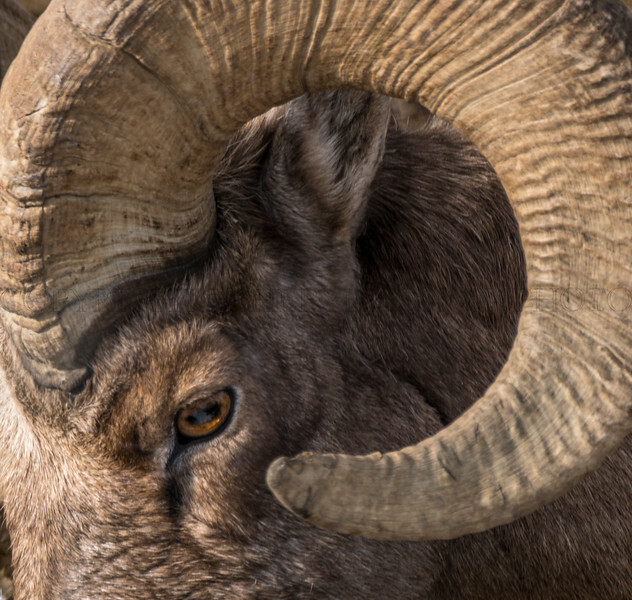 We spotted this big male walking along a narrow ledge on a steep embankment. From our position it looked hair-raising. Volcanic steam pushes up through the rock to release calcium which forms travertine and the terraces. The process is on going and this scene changes daily. The dark colored stripes are made by "thermophiles" heat loving organisms. You see me, I see you. 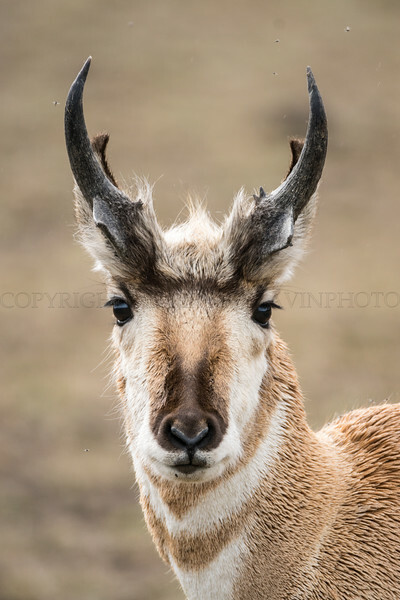 The American pronghorn is unique, not an antelope or deer. They travel a 6000 year old migration route. 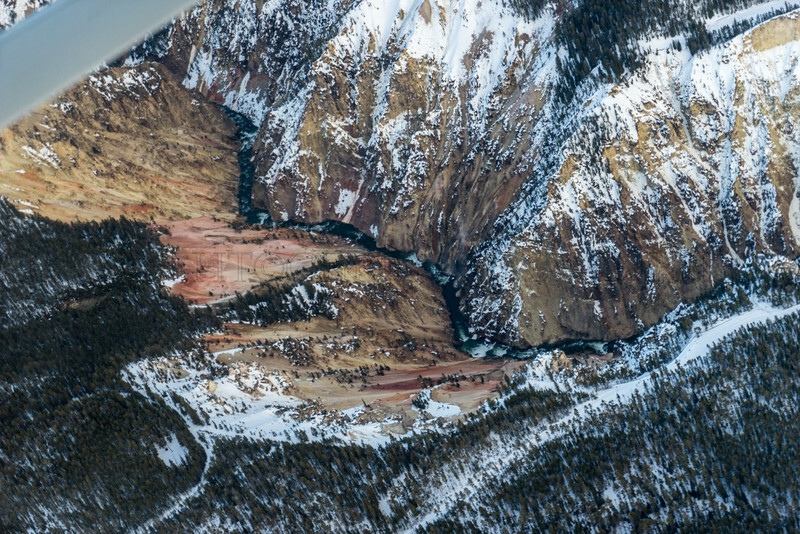 When studied for a while the winter colors of Yellowstone reveal themselves as a splendid array of hues. Weather was a problem in getting up into the air. Luckily before the sun set I got to see Grand Prismatic, the largest hot spring in the park. 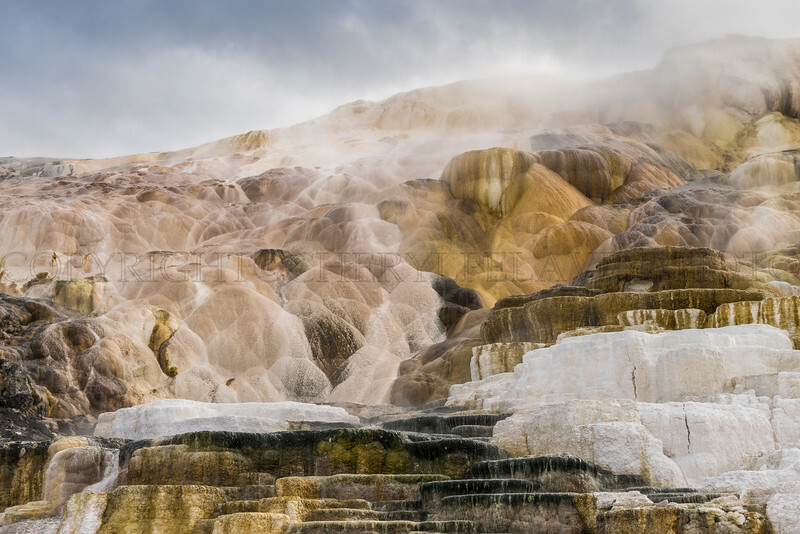 Minerals stain the rocks of Yellowstone from thousands of years of boiling fluid percolating upward; they are yellow, pink, red and white. It is indescribably beautiful.